Staff and children at the Steps Centre for Conductive Education wore blue clothing to raise awareness for Conductive Education week. The centre in Shepshed offers a free service for children who have movement-limiting conditions such as Down’s syndrome and cerebral palsy. The centre also supports the families of the children who attend sessions from across all areas of the East Midlands. Conductive Education is the name given to a remarkable programme which helps children who are differently abled to develop their physical, cognitive, emotional and social skills, enabling them to live as independently as possible. It was founded in the mid-fifties by Professor Peto in Hungary and is based on the premise that everyone can make progress, no matter what their starting point. Professor Peto was quite revolutionary in that he focused on ability and not disability. This is the message which is shouted loud and clear at Steps! During the week, staff, pupils and some parents wore blue, which is the logo colour for Conductive Education, to help raise awareness of this holistic approach to helping children with motor dysfunction or delay. The staff wore blue Superman tops which is very appropriate since they all do such a ‘super’ job! 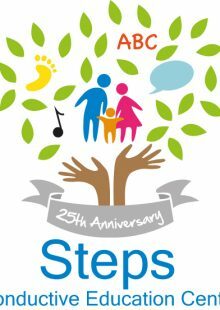 Tags: Conductive Education and Steps Centre.